US is probably the most popular imaging method in children. Its use is becoming more widespread, also among pediatricians who may not place it in any further imaging context. However, a plain radiography of the child's abdomen in recumbent position is strongly recommended when there is suspicion of an abdominal mass and in view of further exploration of the abdomen by imaging means. An initial appreciation of the mass process with regard to its location, size, density (e.g., calcifications) and effect upon adjacent structures (including the skeleton) and its possible interference with the gastrointestinal and/or urinary tracts may be useful to guide the course of imaging evaluation. With this preliminary information, subsequent US is often more straightforward and rewarding, taking into account also the child's history, clinical findings and laboratory results. The finding from the initial abdominal radiography (or US) may prompt an additional radiography of the chest that may, in a positive or negative way, contribute to the diagnostic work-up. US is the most versatile and effective method for taking a first thorough look at the child's abdominal content. It is generally important to use US to initially explore the child's abdomen systematically and carefully. In an abdominal mass, US is often sufficient to establish a reasonable diagnostic assumption based on the anatomical facts. Often, even a specific diagnosis becomes probable by US, so that a given hypothesis about a solid lesion then may need only biopsy for confirmation and possible initiation of treatment. For a nonspecific solid mass found by US, biopsy is the obvious next step (Fig. 6). The strength of US lies in its ability to allow the appreciation of anatomical structures; its limits are in the estimation of organ function, even if there are certain exceptions. On the other hand, Doppler US is used routinely for demonstrating the presence or absence of arterial and/or venous blood flow. It also helps, among the definition of numerous other anatomical structures, to distinguish the hepatic segments. US is the only imaging tool that can provide diagnostic information by making use of physiological organ movement from respiration. 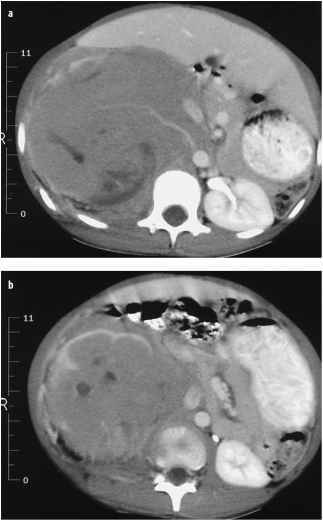 Free movement of the liver over a renal or suprarenal mass (due to nephroblas-toma or neuroblastoma) indicates that the peritoneum is likely not to be involved by the retroperitoneal mass. Similarly, demonstration of some local change of relationship between an adrenal neuroblastoma and the ipsi-lateral kidney indicates likely anatomical separation between the two structures. In the follow-up evaluation of an abdominal mass by US, other criteria become useful parameters, such as persistence or change of size, shape, and echogenicity of a given mass. In the morphologically ambiguous situation of a hematoma, its echo characteristics typically change within days, while a solid tumor's do not, unless it has been traumatized. Fig. 6. B-non-Hodgkin lymphoma in a seven and a half year-old boy who had shown pallor and fatigue for a few weeks. CT with intravenous contrast enhancement shows mid portion of right flank mass (a, b). Mass appears mostly solid and seems to grow intra-and perirenally. 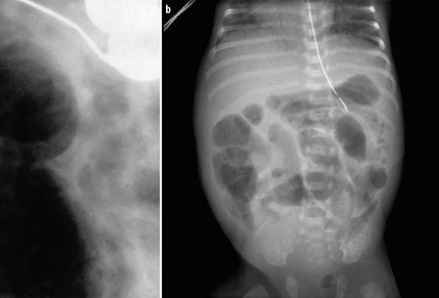 Despite the unusual morphological aspect (and reduced health of the patient) the misdiagnosis of nephroblastoma was made, prompting suboptimal treatment and subsequent fatal outcome. Biopsy would have been indicated prior to therapy mography (MSCT), leads to their more frequent use for evaluating abdominal masses in children. Given the professional effort to protect children from unnecessary radiation and following the 'ALARA' concept (as low as reasonably achievable), there is a tendency to make use of diagnostic MRI. On the other hand, MSCT allows fast and efficient imaging, which is quite attractive for use in children, as it renders complicated anesthesia unnecessary. In neuroblastoma, especially of the thoracic or tho-raco-abdominal type that has a tendency to involve the spinal canal, if available, MRI is the modality of choice. One has to be aware of the fact that in spinal involvement by neuroblastoma, neurological abnormality or dysfunction is often rather mild or even absent. MRI is recommended in a solid or cystic pelvic mass, especially if it is due to some gynecologic malformation (e.g., hydro- or hemato-metrocolpos) or neoplasia. The need for immobility means that the pelvis and retroperi-toneum are better suited for evaluation by MRI than the anterior abdomen, which is more exposed to physiological motion from cardiac and respiratory dynamics. While the imaging technique is considerably improved through the use of cardiac and respiratory gating and rapid sequences, there are often difficulties in aiming for high diagnostic precision, especially in infants and young children. MRI is, nevertheless, recommended in tumorous abnormalities of the liver and biliary tract for morphological analysis of the mass, as well as the involved canalicular hepatic structures. MSCT and CT are excellent at defining an abdominal mass, either benign or malignant. CT characterizes the mass by measuring its density, it localizes the mass and demonstrates its extension, both with high precision. In most instances it is possible to locate the organ or site of origin of a mass. In a malignancy, tumor spread may be accurately recognized, as well as enlarged or unenlarged lymph nodes, as possible metastatic manifestations. The degree of uptake of systemically introduced contrast material by a solid mass allows estimation of its perfusion (i.e., vitality) and, conversely, the lack of perfusion may point toward necrosis of the mass. The same applies to MRI. Perfusion criteria may be valuable when evaluating a potentially metastatic lesion using either method. MSCT and CT are most accurate and practical for diagnosing nephroblastoma, its spread and further complications within the regions of the abdomen, chest and skull. Two-dimensional and Doppler US for the evaluation of venous tumor spread up to the right atrium are the complementary examinations of choice. MSCT and CT are excellent for diagnosing and staging abdominal lymphoma and other infiltrative or complex abdominal masses (Fig. 7). However, MRI may be used with comparable accuracy. In view of possible functional disturbance of the urogenital and/or gastrointestinal tract by the mass, scintigraphy and/or conventional digital radiographic/fluoroscopic contrast studies may be necessary in the diagnostic work-up. These will yield functional as well as additional or confirmatory anatomic information. Biliary scintigraphy may be considered for a cystic hepatic mass in order to demonstrate or exclude a direct or indirect relationship of the mass with the biliary system. Skeletal scintigraphy may be helpful for evaluating metastatic disease, i.e., in staging of neuroblastoma or other bone metastasizing abdominal malignancies. However, MRI may be used instead of scintigraphy in the diagnostic work-up of metastatic bone disease. Meta-iodobenzyl-guanidine (MIBG) scintigraphy is valid for demonstrating various forms of primary and/or metastatic neuroectodermal tumors.